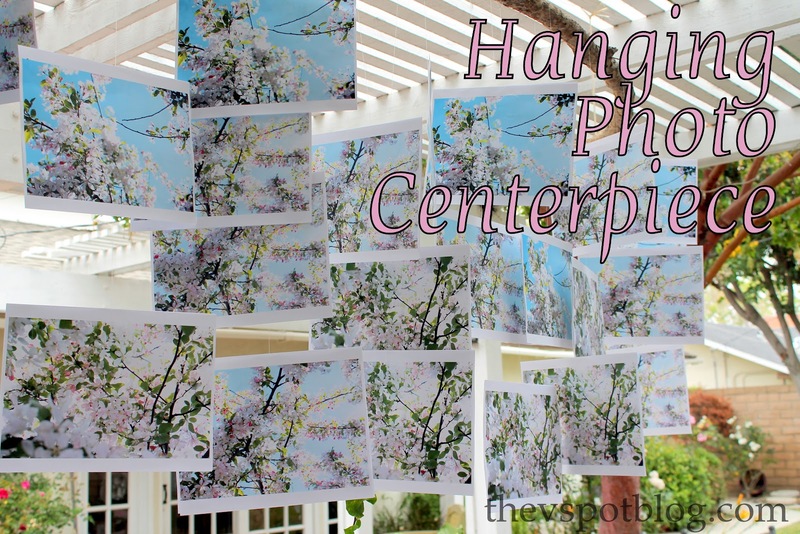 A hanging centerpiece using photos and branches. 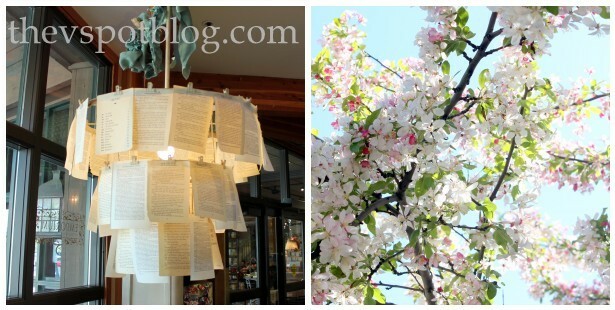 This book page chandelier and the photos of this beautiful tree served as my inspiration. I wanted them to have the image on both sides. I took some fishing line and taped it to the back of the paper, then added double-stick tape and sandwiched the line in-between the two images. Handsome Hubby hung the branch from the top of our patio cover and then simply looped the photos over the branch. I had the photos with the most sky near the top, only a little sky in the middle and just a close up of the blossoms near the bottom. My tablecloth this year was literally a drop cloth and I added a champagne bucket filled with Bougainvillea clippings from my yard. The photo printing cost about $25 but I already had everything else. Pretty affordable. I don’t know that I loved the end result, but I liked it well enough. My guests thought it was great… and in the end, isn’t that what matters the most? I hope everyone had a lovely Mother’s Day. What a great idea! This would also be great with photos of someone for a birthday party! Maybe at different ages… Thanks for the inspiration! Looks gorgeous! I knew it would. 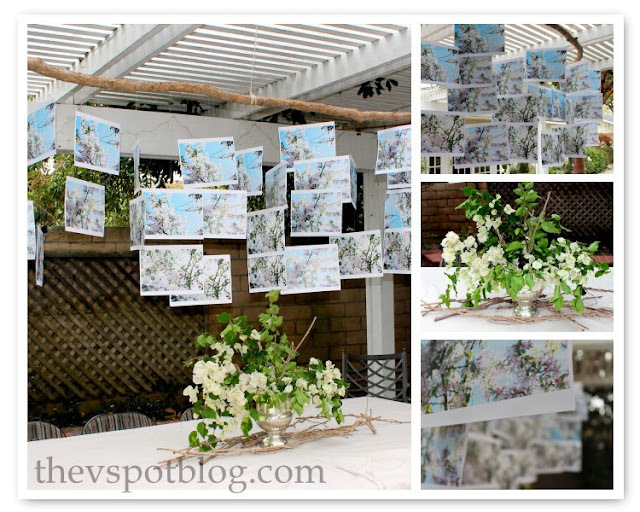 So clever…and really beautiful over your backyard table! I love it! This is really clever, Vivienne, and makes a gorgeous statement! 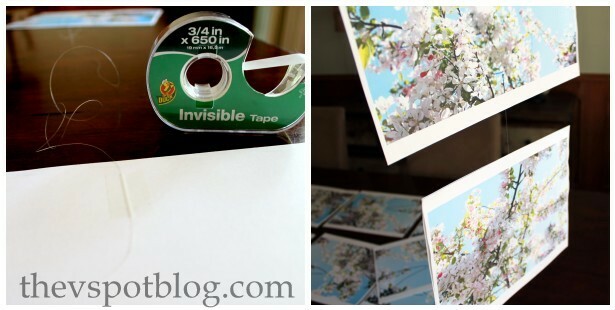 Good idea to have the photos printed–I’m amazed at how much ink my printer goes through to print photos, and ink cartridges are so expensive! My favorite things? The bougainvillea in the champagne bucket and the fact that you host a Mother’s Day brunch. So cool. It’s gorgeous as always. I love it! I think it is perfect!! Just the right touch. It turned out beautiful! I think I can appreciate it more now that I’ve seen the infamous back patio! I’m thinking about another trip to Cali in August for M’s 18th birthday with her cousin and her Mom who turns 18 just a few weeks before her. They want to go to the Ellen show, sight see and shop. If we make that happen you’ll need to join us! This is such a lovely display! Hi Vivienne! What a great and creative idea. I love how it float all the way down the table. It looks like the tree is blooming! Very very inspiring! I’m tucking this idea away for a future table! Hey Vivienne, Hope you had a great Mother’s Day. This looks so delish. I would love to give it a try. I blogged about my SNAP sign today & I put a pic of your cute self in my post. Hope that’s OK! I can’t believe you don’t love that – it’s awesome!! Funny – that inspiration pic of the clip chandelier – I have that over my kitchen table with vintage map pages! It’s my latest post – just went up yesterday!! The Great Halloween Party wrap up.